Death is a lonely guy. That’s the sort of thing that comes with the territory when you basically kill everyone you touch, but nonetheless, that is the dilemma faced by the Not So Grim Reaper. 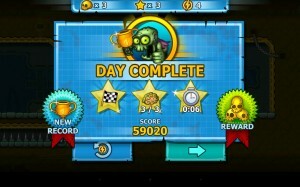 To combat his solitude, he opens up a factory to train an army of zombie minions called Deadlings. Hard to say how many of those under his employ are likely to add him as a Friend on FaceTome, but at least he’s not lonely any more. 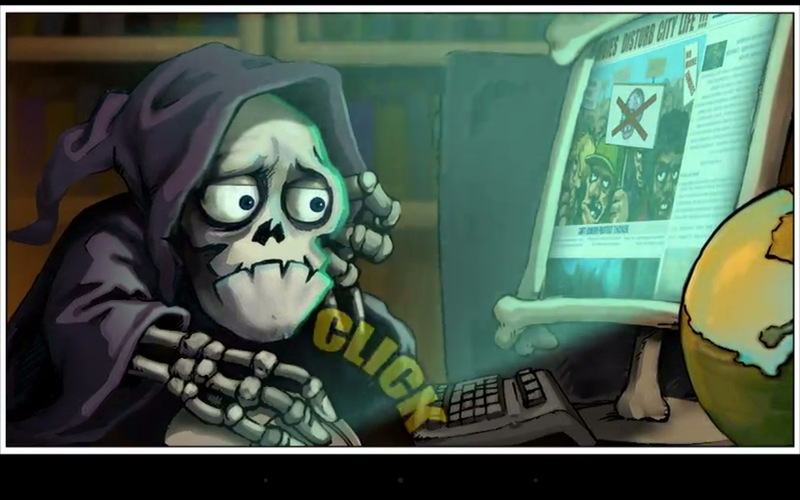 Still, Death being Death, it seems he can’t help but send his newfound friends off to their potential… um, demise? Destruction? You get the idea. 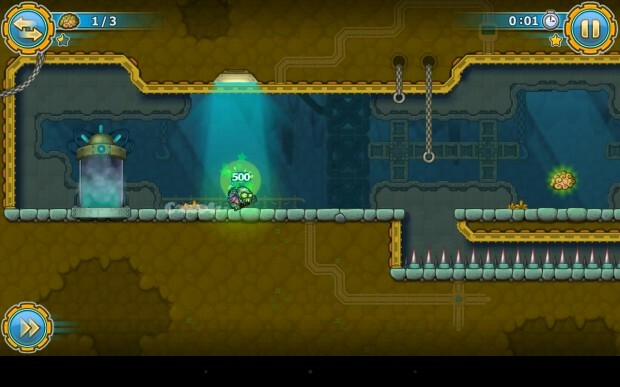 He has them run through a series of laboratory mazes to collect as many brains as possible before reaching the end. 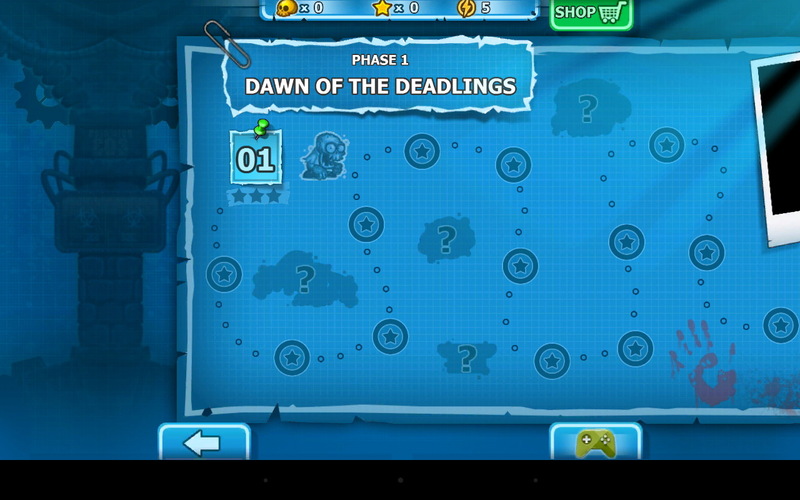 To reach the end of each maze, you’ll need to employ the unique abilities of several different Deadling types. 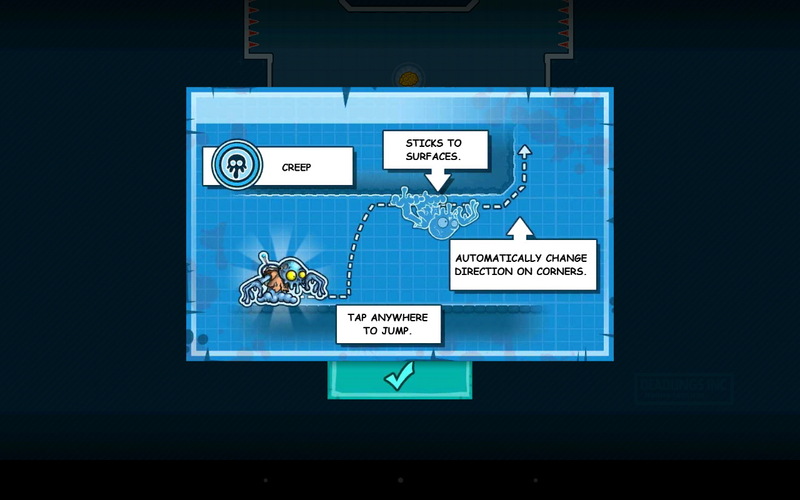 Some run and jump, while others will adhere to floors and walls before jumping to affix themselves to an opposing surface. Still more fly through means of natural gas propulsion, and there are even robotic versions who only move when you tell them to, versus the automatic forward movement the rest use. Controlling them is fairly simple, with one touch anywhere on the screen being all that is needed to get them to do their thing. Each has their own quirks with regards to speed and motion, which can make for some tricky platforming– particularly as they’re all rather fragile and prone to dying, some more easily than others (the running Bonesacks will die just from hitting a wall). 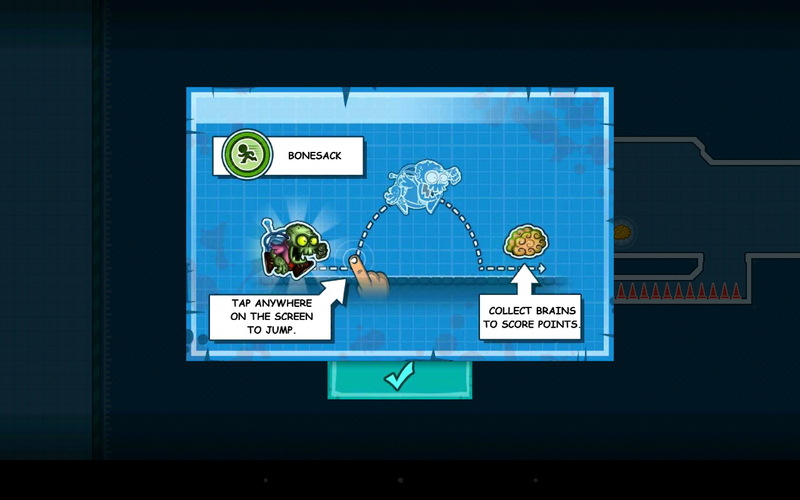 Getting brains located near the stage exit can prove tricky at time, too, as touching it can automatically end the stage before you’ve collected everything nearby. Fortunately, despite their frail nature and nuances, the controls are at least consistent and precise– maybe even too much so, as occasionally a runner seemed a little jump-happy. Give Us Your Brains… and Your Money! It can be a little frustrating at times to maneuver the Deadlings to get all the brains littering an area without dying, but there are ways around this. 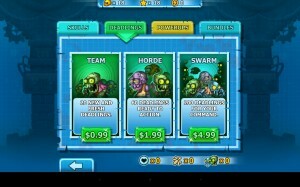 The in-game currency of skulls can be used to purchase additional Deadlings, respawn a recently-dismembered Deadling in a safer area (though that’s sometimes easier said than done), remove traps, and so forth. 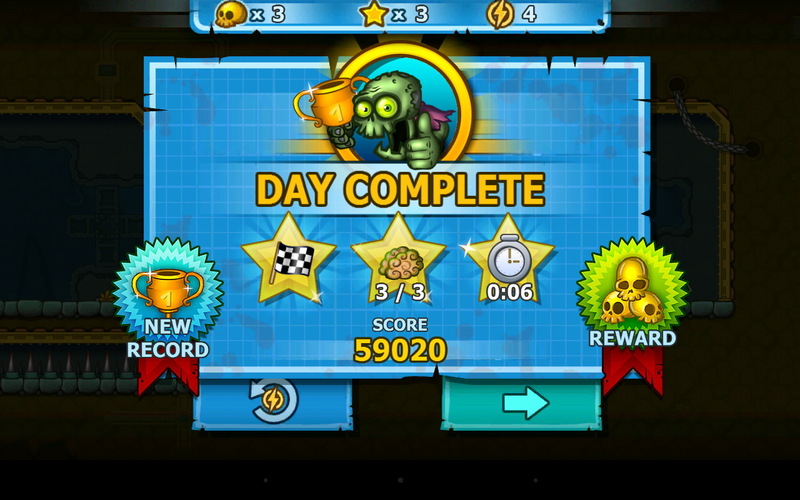 You can earn skulls in-game up to three at a time for each star you get when completing a stage. Alternatively, you can just break out the credit card and buy a bucketful and start sending Deadlings to their doom without a care. 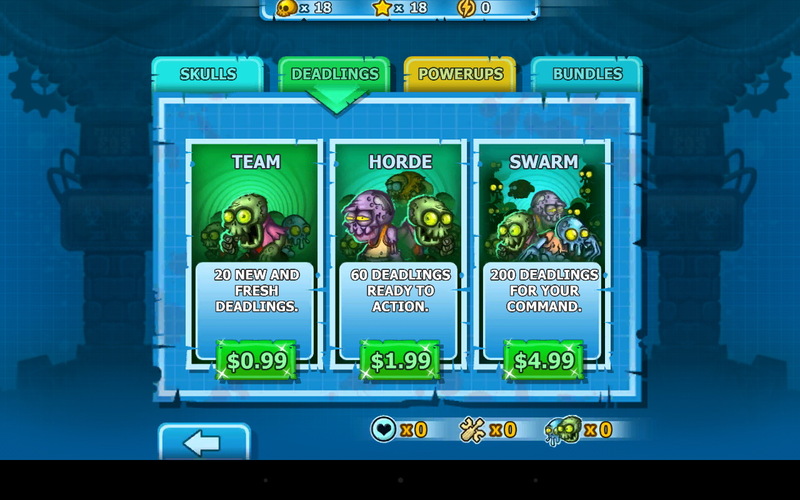 Similarly, you can also purchase Deadlings themselves, power-ups, or both in bundles. The other form of monetization in the game comes in the form of Charges. These replenish over time, and you lose them as you enter stages and when you lose lives, thus limiting your playtime– after a little while, you’re likely to hit a wall where you need to either wait out the clock, buy a charge for ten skulls, or just be done with the whole thing for a flat fee. 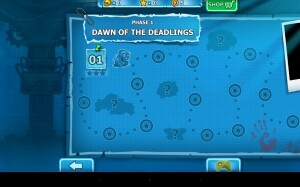 Despite whatever minor flaws the game has, Deadlings is an overall fun game with heart and a fun sense of humor. 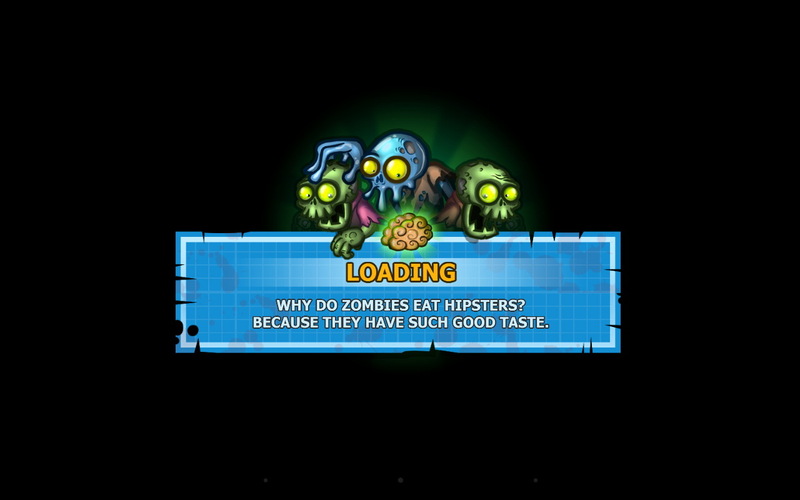 The Deadlings and Death have character, and there is a nice bit of strategy to be employed as well. The only particular thing to recommend being aware of is the game’s advertising of over 100 levels spread across it’s four stages; we counted only 60, though the game notes that there are more to come soon. FREE · Platform · Artifex Mundi sp. z o.o. 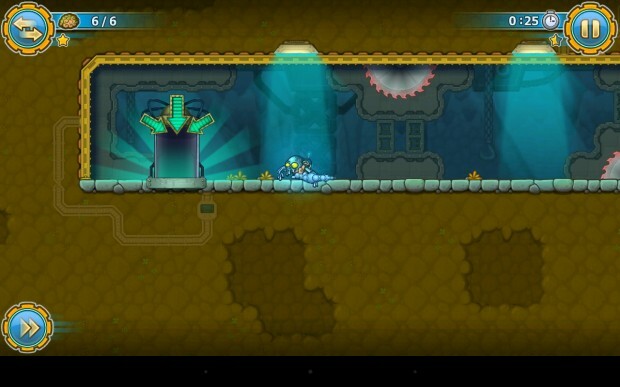 Wow this game is so addictive and the graphics are awsome!